What a awesome weekend to be a Star Wars fan with Star Wars Celebration Anaheim officially coming to a close this afternoon. We got many teases and treats for all the upcoming films, video games, books, and more. Star Wars: The Force Awakens got even more exciting with the surprise reveal of a new teaser trailer with Han Solo and Chewbacca making an appearance for the first time since Return of the Jedi. Star Wars: Battlefront also had a trailer to show, as did season 2 for Star Wars: Rebels. Many of our favorite people in the Star Wars galaxy were interviewed, sat in on panels, and generally hung out with the fans making this an incredible event (more on that below). This was the first time I’ve ever experienced a Star Wars Celebration event. 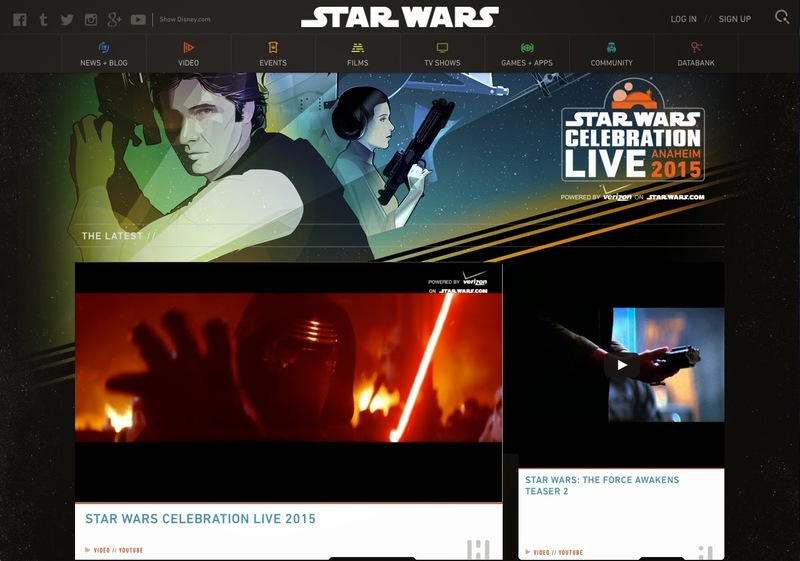 Unfortunately I couldn’t actually be there in Anaheim, CA to attend the event, but I did do as much live-streaming on StarWars.com as possible. So I consider this the first Star Wars Celebration I’ve been aware of in real time (my first Star Wars Celebration will be when I’m physically able to go one). 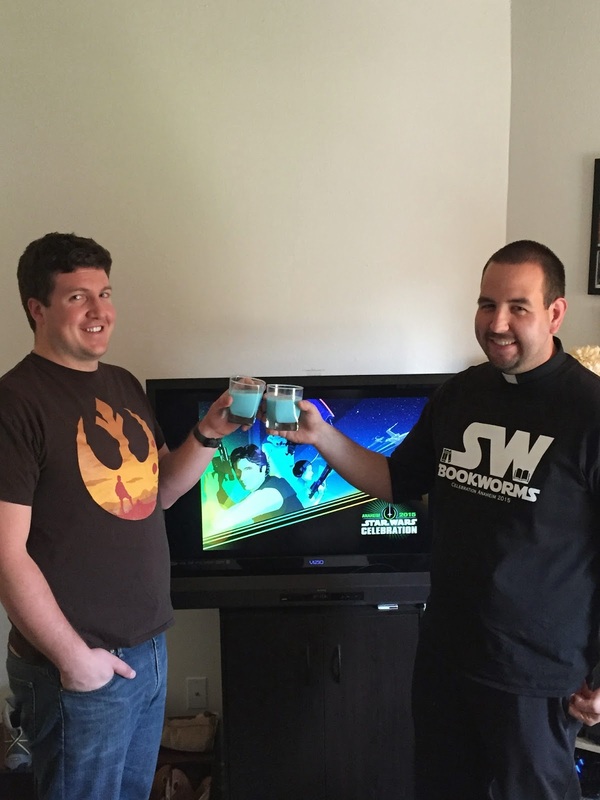 A good friend of mine, Sean, and I had a stream party Friday evening and even made some Bantha Milk drinks. 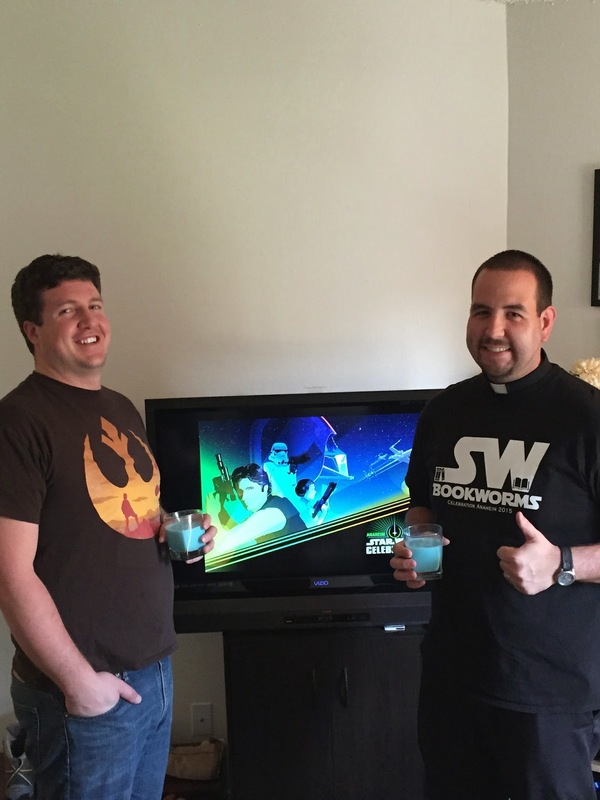 It was a great time to watch the live stream of SWCA and just totally geek out together about all things Star Wars! During J.J. Abrams and Kathleen Kennedy’s panel on The Force Awakens, I was in my Theological Anthropology class so I missed the big reveal of the teaser trailer (but watched it immediately after class and was interiorly whooping with excitement!). I was able to go back later and re-watch the whole panel and am even more excited for the movie to come out in December. BB-8 astounded me. I was definitely one of those fans who was skeptical of the new little droid, but seeing the droid actually roll around the stage as a real prop (and not just CGI) I was blown away, and found I’m way more excited to see BB-8 in the movie that I originally was. Kylo Ren also has me super pumped. His whole demeanor reminds of Darth Revan from Star Wars: Knights of the Old Republic and I’ve always loved that sort of demeanor in a dark character. Can’t wait to see more of him. And of course, there’s Han Solo and Chewbacca…I was so happy to see them in the teaser. As the afternoon progressed I just turned on the live stream on my Mac in my room and watched as much as I was able to. Unfortunately for me, since the live stream pretty much covered only the main stage, I wasn’t able to see many of the panels that I would have liked to have seen if I was there in person (such as the panels relating to the Star Wars Novels universe including panels with some of my favorite authors and I also missed the podcast stage and getting to see my favorite Star Wars podcasts up there). Even so, I got to watch Ian McDiarmid’s “The Emperor Strikes Back” interview, Carrie Fisher’s “A Date With the Princess,” some of Ray Park’s interview, the Lego Star Was panel with Anthony Daniels, some of the Star Wars: Rebels panel, the beginning part of Smuggler’s Bounty, along with many of the random interviews in the Cantina with Anthony Carboni, which was awesome since the more informal setting allows for those interviews to be really cool and and off the cuff. What I find absolutely astounding about the whole event is two-fold. First I love the fact that there are so many kids there, asking questions and just loving everything Star Wars. And second, I love the generosity of everyone involved, specially the actors/actresses of Star Wars. I was blown away by all the kids asking questions (from innocent “Who did the voice of Chopper in Star Wars Rebels?” to more probing questions “How did Captain Rex survive the Clone Wars?”) and their energy and joy for Star Wars. The actors/actresses on the other side were awesome in response. Anthony Daniels interacted very well with his young fans of C-3PO and Ray Park even borrowed one kid’s dual-bladed lightsaber to spar with against James Arnold Taylor and then signed it before giving it back to his young Darth Maul fan. It was incredible to see the awe and wonder that these kids have and are able to experience at such an event. Being able to live stream this event was a huge blessing for me. I’ve embraced Star Wars as my hobby (in a very real and existential way, and am vocal about it a lot more, even if my friends tease me because of it – Freddie Prinze Jr. said here: “people are gonna make fun of you no matter what, so commit to what you love and don’t care what anyone says”) and live-streaming the event made me feel a part of the whole experience without actually being there. My live-stream party was a ton of fun and a great way to virtually go to Star Wars Celebration. But, of course, it really makes me feel disappointed that I was not able to go. I really hope I can go in the future — but as next year it will be in London (July 15-17, 2016), I probably won’t be able to go since flying outside the country will be a bit more difficult for me to schedule since I’ll be a newly ordained Catholic priest *possibly* on my way to World Youth Day in Poland that same summer. (Another live stream party will be in the works!) Such is the life. 🙂 Maybe 2017 will be my year for Star Wars Celebration.